A major facilitator superfamily transporter Dehp2 was recently shown to be playing an important role in transport and biodegradation of haloacids in Paraburkholderia caribensis MBA4, and Dehp2 is phylogenetically conserved in Burkholderia sensu lato. We designed both Burkholderia sensu stricto-specific and Paraburkholderia-specific qPCR assays based on dehp2 and 16S rRNA, and validated the qPCR assays in 12 bacterial strains. The qPCR assays could detect single species of Burkholderia sensu stricto or Paraburkholderia with high sensitivity and discriminate them in mixtures with high specificity over a wide dynamic range of relative concentrations. At relatively lower cost compared with sequencing-based approach, the qPCR assays will facilitate discrimination of Burkholderia sensu stricto and Paraburkholderia in a large number of samples. For the first time, we report the utilization of a haloacids transporter gene for discriminative purpose in Burkholderia sensu lato. This enables not only quick decision on proper handling of putative pathogenic samples in Burkholderia sensu stricto group but also future exploitation of relevant species in Paraburkholderia group for haloacids biodegradation purposes. Burkholderia sensu lato includes versatile members that have dramatic different living-styles and occupy diverse ecological niches [1–6]. The most infamous species are Burkholderia pseudomallei and Burkholderia mallei which cause melioidosis and glanders in animals and humans [7–10]. Besides that, Burkholderia cepacia complex (Bcc) includes many closely-related opportunistic pathogens such as Burkholderia cenocepacia and Burkholderia multivorans [11–14]. There are also many species isolated from the environment with biotechnological application potentials, such as plant growth promotion, antibiotics production, and biodegradation of pollutants [4, 5, 15–17], which are generally defined as “plant-beneficial-environmental (PBE) cluster” [18–20]. Phylogenetic analysis based on single gene such as 16S rRNA, recA, fur, acdS, hisA and rpsU have revealed the complexity of their evolutionary relationships [21–26]. Based on assessment of conserved sequence indels, a new Paraburkholderia genus was created to include the diverse environmental isolates while Burkholderia sensu stricto includes B. mallei, B. pseudomallei, Bcc members and other pathogenic members . The complicated taxonomy of Burkholderia sensu lato has attracted great attention, and large scale phylogenomic study has been suggested . In accordance with this suggestion, a recent study systematically analyzed the conserved sequences in 92 Burkholderia sensu lato species and demonstrated the existence of 5 lineages: Burkholderia sensu stricto, Paraburkholderia, Caballeronia, the newly described genus Robbsia , and the lineage represented by Paraburkholderia rhizoxinica . Assessment of the phylogenetic position of new isolates or samples containing Burkholderia or Paraburkholderia could be useful for further analysis, and there have been such reports based on molecular techniques such as PCR [22, 31–34], multi-locus sequence typing (MLST) [35–38] and qPCR assays [39–41]. As qPCR could sensitively quantitate the target and is accessible to more places compared with sequencing-based approaches, it has great application potentials in the phylogenetic studies of Burkholderia sensu lato. Paraburkholderia caribensis (formerly Burkholderia caribensis) MBA4 is a bacterium with the ability to degrade environmental pollutant haloacids . Besides the hydrolytic enzyme dehalogenase, membrane transporters that mediate active uptake of haloacids are also important for effective biodegradation [43–45]. Although structurally similar, haloacetate is transported with a different system compared with acetate . We have recently revealed that P. caribensis MBA4 harbors two haloacids transporters, Deh4p and Dehp2, which show overlapping but not identical substrate specificities [45, 47]. The expression of dehp2 is strictly regulated in response to the presence of haloacids in its growing environment, and the ~ 100 bp upstream non-coding region of dehp2 is highly conserved in Burkholderia sensu lato . Three strains from other environmental Paraburkholderia species, namely P. caribensis LMG 18531, Paraburkholderia phymatum (formerly Burkholderia phymatum) STM815, and Paraburkholderia xenovorans (formerly Burkholderia xenovorans) LB400, gained the ability to degrade haloacids with the introduction of dehalogenase Deh4a, and haloacids-inducible haloacids transport activities were observed in accordance with haloacids-inducible expressions of dehp2 orthologs, strongly suggesting their roles as haloacids transporters . Dehp2 thus represents a group of conserved transporters in Burkholderia sensu lato, and the phylogenetic tree based on Dehp2 clearly show two clades corresponding well to Burkholderia sensu stricto and Paraburkholderia . This provides the ground of exploiting Dehp2 for discrimination of Burkholderia sensu stricto and Paraburkholderia. In this study, we tested the utilization of dehp2 as a phylogenetic marker for quick discrimination of putative pathogenic/opportunistic pathogenic Burkholderia sensu stricto and mainly environmental-derived Paraburkholderia. We designed qPCR assays that target the regions of dehp2 and 16S rRNA conserved in Burkholderia sensu stricto or Paraburkholderia and validated their performance in 12 strains of bacteria from Burkholderia sensu lato. The results showed that dehp2 could be used as a discriminative marker similarly as 16S rRNA, and assays based on both markers produced more reliable results with high specificity and sensitivity. This is the first report on the utilization of a haloacids transporter as a discriminative marker in Burkholderia sensu lato, which will be useful for further clinical or biotechnological studies. As described previously, both 16S rRNA and dehp2 phylogenetic trees display two major groups which could discriminate Burkholderia sensu stricto and Paraburkholderia species [5, 43]. We first designed three pairs of qPCR primers based on 16S rRNA: 16S-F1/R1 to target the region conserved in Burkholderia sensu lato, 16S-F2/R2 to target the region conserved in Burkholderia sensu stricto, and 16S-F3/R3 to target the region conserved in Paraburkholderia. Similarly, we designed dehp2-F6/R6 and dehp2-F7/R7 to target Burkholderia sensu stricto-specific and Paraburkholderia-specific regions of dehp2. To ensure that the primers cover all the sequence variations, we incorporated degenerate bases during primer design, which have been a common practice in microbial studies , such as microbial population taxonomy , diversity of functional genes related to antibiotic or arsenite resistance, etc. [51, 52]. We first analyzed the performances of the 5 pairs of primers against the 12 strains using a single strain as the template for each qPCR reaction (Fig. 1). For the Burkholderia sensu lato-conserved primer pair 16S-F1/R1, all 12 strains showed similar amplification efficiency. The Burkholderia sensu stricto-specific primer pair 16S-F2/R2 had statistically higher amplification efficiency with the 4 Burkholderia strains and C. glathei LMG 14190, while the Paraburkholderia-specific 16S-F3/R3 primer pair showed statistically higher amplification efficiency with the 7 Paraburkholderia strains. For dehp2, the Burkholderia sensu stricto-specific primer pair dehp2-F6/R6 had statistically higher amplification efficiency with the 4 Burkholderia strains, while the Paraburkholderia-specific dehp2-F7/R7 primer pair showed statistically higher amplification efficiency with the 7 Paraburkholderia strains and C. glathei LMG 14190. It should be pointed out that the amplification efficiency of qPCR assays will be affected by degenerate primers, but the amplification efficiencies of our discriminative qPCR assays show such dramatic differences between Burkholderia sensu stricto and Paraburkholderia group that they still enable effective discrimination of the two group even with the use of degenerate primers. The performances of primers targeting dehp2 were comparable to 16S rRNA-based primers, suggesting dehp2 could be used as a marker for discrimination of Burkholderia sensu stricto and Paraburkholderia. The above results clearly showed that the 4 pairs of discriminative primers work well in regard to their ability to discriminate Burkholderia sensu stricto and Paraburkholderia. The interesting species is C. glathei, as qPCR patterns based on 16S rRNA assays were similar to Burkholderia, while qPCR patterns based on dehp2 assays were similar to Paraburkholderia. This seemingly contradictory results showed the uniqueness of this species, which is supported by its recent transfer to a new genus Caballeronia . The above results showed that the qPCR assays are able to discriminate whether the samples contain Burkholderia or Paraburkholderia species when we used a single bacterial species as the qPCR template. For environmental or clinical samples collected without further cultivation and isolation, it is common that they contain different bacterial species. To test whether our qPCR assays are capable of specific discrimination of Burkholderia or Paraburkholderia species, we mimicked such conditions by preparing mixtures of gDNA from known species. We first tested three conditions: equal concentration mixture of 2 Burkholderia species, mixture of 2 Paraburkholderia species, and mixture of 1 Burkholderia species and 1 Paraburkholderia species. Our qPCR assays could clearly tell whether there are only Burkholderia, only Paraburkholderia, or both genera in the samples, which are also consistent with values calculated from qPCR results of single species (Fig. 2a). In addition to the equal concentration mixtures, we further assessed mixtures of Burkholderia and Paraburkholderia species at constant total concentration but different ratios. qPCR showed that for relative ratios of 1:125, 1:25, 1:5, 1:1, 5:1, 25:1 and 125:1 of B. cenocepacia LMG 16656 to P. caribensis LMG 18531, all the 4 pairs of discriminative primers exhibited specific detection (Fig. 2b). We then used the Delta-Ct values between the Burkholderia sensu stricto-specific and Paraburkholderia-specific primers (16S-F3/R3 vs. 16S-F2/R2, dehp2-F7/R7 vs. dehp2-F6/R6) to monitor their ability to discriminate the two genera. This approach could also avoid possible interference by other closely related bacteria. For the dynamic range tested, high correlation coefficients were observed for Delta-Ct values against different ratios of the two genera for both 16S rRNA and dehp2 (Fig. 2c). The results showed that our qPCR assays can specifically discriminate Burkholderia and Paraburkholderia species with a wide dynamic range of relative ratios. We then used HC and PCA to analyze the qPCR results for more straightforward visualization. For the qPCR data collected against single species or mixtures as described above, we first used HC to construct a heat-map. Both the primer pairs and samples were clustered relevant to the genus they belong, facilitating easy interpretation of the results (Fig. 3a). The uniqueness of C. glathei LMG 14190 is also shown in the heat-map. For PCA score plot, the positions of the mixtures are straightforward display of their relative proportion of Burkholderia or Paraburkholderia (Fig. 3b). 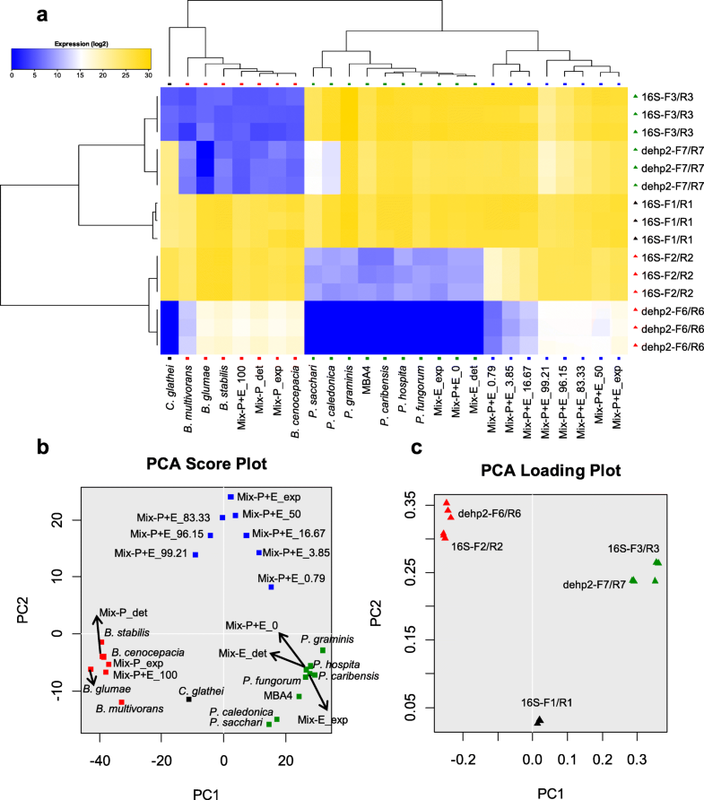 For PCA loading plot, the positions of the primer pairs also indicate whether they are targeting Burkholderia sensu lato-conserved, Burkholderia sensu stricto-specific or Paraburkholderia-specific region (Fig. 3c). In general, HC and PCA displays of the qPCR results facilitate easy detection of the presence and relative quantity of Burkholderia and Paraburkholderia species. 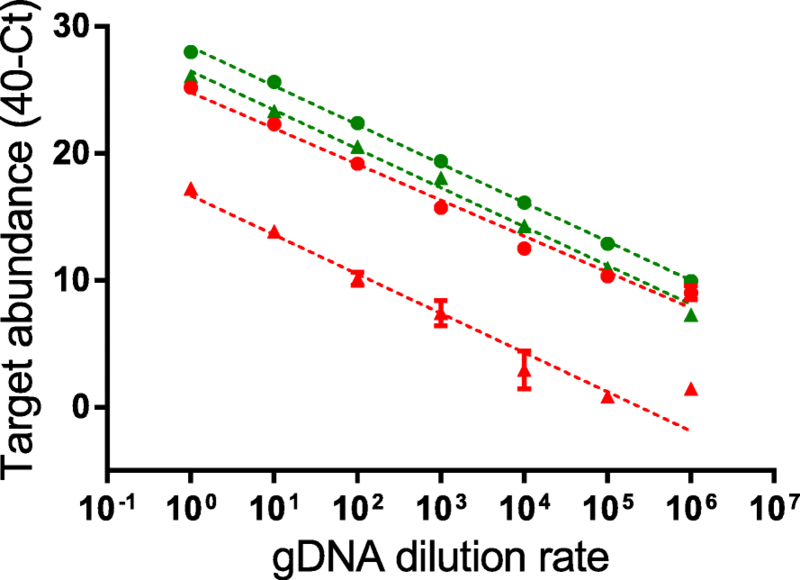 Our qPCR assays are able to specifically discriminate Burkholderia and Paraburkholderia species in complicated samples, and the amplification specificities of the 4 discriminative PCR assays were further confirmed by using gDNA of E. coli DH5α as negative control (Additional file 1: Figure S1). We then checked their sensitivity at detecting the target species. We prepared serial diluted bacterial gDNA of Burkholderia and Paraburkholderia, and for a dynamic range of six orders of magnitude, all 4 pairs of primers worked consistently (Fig. 4). The targets were approaching several-copies to even single-copy per qPCR assay for the lowest concentration tested (calculated to be < 10 copies μl− 1), and all primer pairs were performing well except for Burkholderia sensu stricto-specific dehp2-F7/R7, which is relatively less efficient compared with the others. This is reasonable, as haloacids transporter gene is a good marker for environmental rather than pathogenic species. The above results showed that our qPCR assays are highly sensitive for detection of low-quantity of Burkholderia and Paraburkholderia target in the samples. Considering the pathogenic potentials of some species in Burkholderia sensu lato, it is useful to first have a quick assessment before further analysis such as sequencing, especially when there is a large number of specimens. As some bacteria may not be cultured successfully, qPCR assay should be more sensitive than culture-dependent detection methods. On the other hand, although high throughput sequencing is more powerful to give a global view of genomes, qPCR can actually show very consistent results towards specific targets at much lower cost . Moreover, qPCR is also easier to handle and accessible to more places compared with sequencing-based identification approaches. With these advantages, there have been many qPCR based methods for detection or discrimination purposes in Burkholderia sensu lato. For example, qPCR assay based on Type III Secretion System enabled quick and accurate identification of B. pseudomallei , and qPCR assay Bu550 that targets a 7 kb locus was able to discriminate B. ubonensis from its close neighbor B. pseudomallei . Multi-target qPCR assays were able to detect the presence of Bcc members at the resolution of species from sputum specimens . Our study represents the first application of a haloacids transporter gene to discriminate Burkholderia and Paraburkholderia, which will be useful for not only detecting pathogenic species but also screening environmental species that can be exploited for bioremediation of haloacids. It has been suggested that phylogenetic relationship could not be reliably established based on single gene , and the inclusion of more independent targets increased the sensitivity compared with single target method for identification of B. pseudomallei [41, 57]. In this study, we also considered this issue and utilized both the haloacids transporter gene dehp2 and 16S rRNA. Indeed, there were in-consistence between results obtained from assays based on dehp2 and 16S rRNA in regard to C. glathei, which was transferred to a novel genus recently , further supporting the reliability of the assays. Moreover, our qPCR assays were designed to target regions conserved in both pathogenic Burkholderia sensu stricto species and environmental Paraburkholderia species, and the Delta-Ct values between Burkholderia sensu stricto-specific and Paraburkholderia-specific assays could be utilized to calculate the relative ratio of the two genera in mixtures. 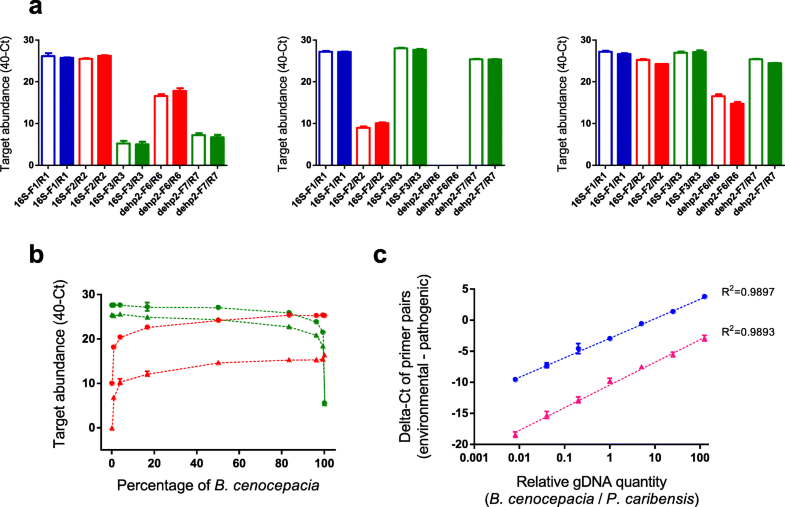 The combination of qPCR assays that target both Burkholderia-specific and Paraburkholderia-specific regions in dehp2 and 16S rRNA could rule out possible inference by other related environmental bacteria. High sensitivity and specificity of such assays were observed for both dehp2 and 16S rRNA over a broad dynamic range of mixtures from both genera. Our previous work has established Dehp2 as a haloacids transporter [43, 47], and the successful application of this gene to discriminate Burkholderia sensu stricto and Paraburkholderia further proved its importance for Burkholderia sensu lato. As haloacids are not the natural nutrients for pathogenic Burkholderia species and even some of the environmental Paraburkholderia species, the presence of this transporter showed gene expression rewiring and adaption potentials of bacteria to their living environment. Further analysis of this transporter gene among the two genera, such as evolutionary analysis of key amino acid residues and comparative assessment of the promoter regions between pathogenic and environmental species should provide precious clues for understanding of the transport mechanisms and technological exploitation of relevant species to efficiently degrade haloacids without causing pathogenic risks. It should be pointed out that, however, qPCR assay is just a first step for full understanding of the bacteria or samples. As has been cautioned, phylogenetic positions not necessarily confirm whether a Burkholderia or Paraburkholderia species is pathogenic or not [5, 6, 58]. The results based on this qPCR assay should raise our attention to putative pathogenic species that must be handled carefully, and the samples suggested to be in the environmental group should also be systematically assessed before wide technological applications. Another fact that should be emphasized is that we only tested the qPCR assays in 12 bacterial strains, which represent a relatively small sampling of the > 100 of strains from Burkholderia sensu lato. Further assessment of the assays in a larger sample pool of Burkholderia sensu lato members will be beneficial for the research field and broad applications of the assays. 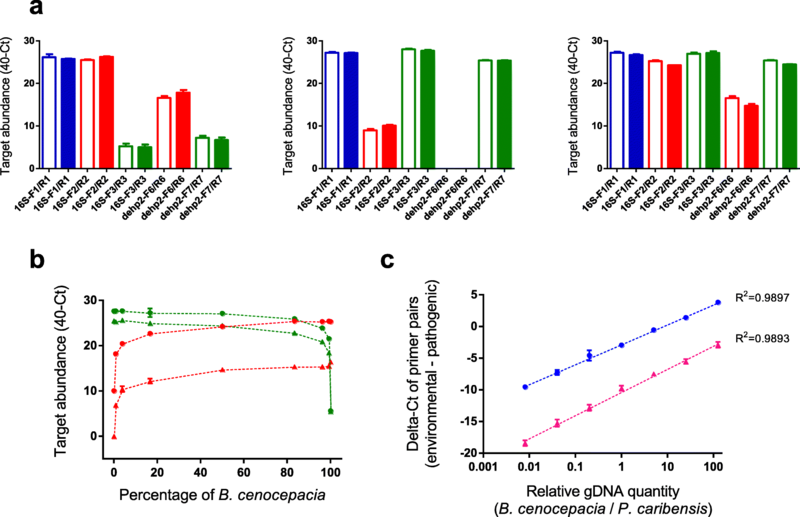 In this study we designed qPCR assays based on haloacids transporter Dehp2 as well as 16S rRNA, which enable quick discrimination of Burkholderia species and Paraburkholderia species with high sensitivity and specificity. 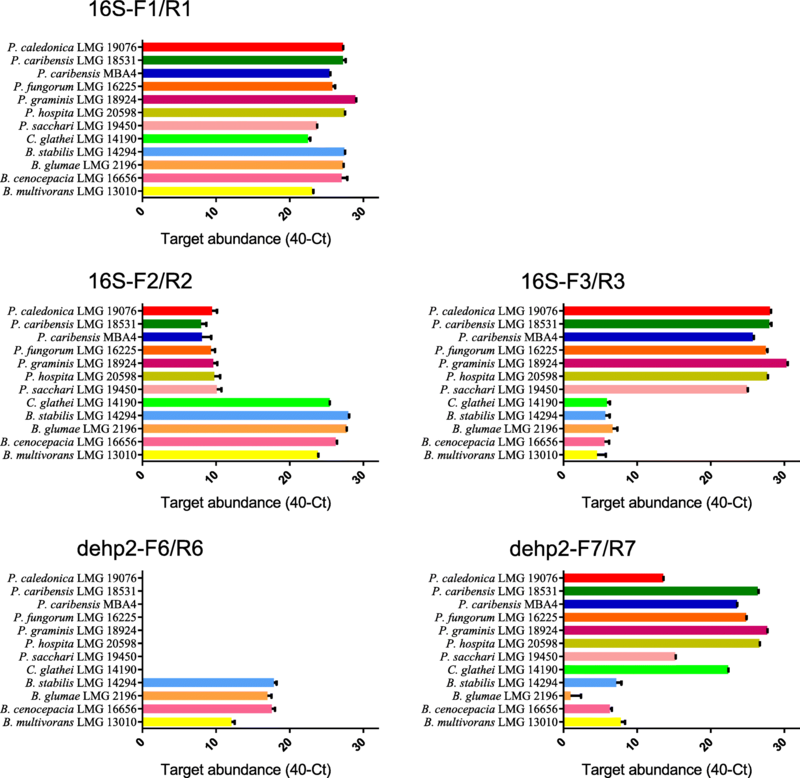 Results obtained with the qPCR assays will facilitate more specific handling in regard to the putative pathogenicity of the samples and also exploitation of relevant species for haloacids bioremediation. We used 12 strains from 11 species from Burkholderia sensu lato in this study, namely Paraburkholderia caledonica LMG 19076, P. caribensis LMG 18531, P. caribensis MBA4, Paraburkholderia fungorum LMG 16225, Paraburkholderia graminis LMG 18924, Paraburkholderia hospita LMG 20598, Paraburkholderia sacchari LMG 19450, Caballeronia glathei LMG 14190, Burkholderia stabilis LMG 14294, Burkholderia glumae LMG 2196, B. cenocepacia LMG 16656 and B. multivorans LMG 13010, which were gifts from Molecular Microbiology Laboratory of The University of Hong Kong (Table 1). Genomic DNAs (gDNAs) from the 12 strains were extracted with a G-spin™ Genomic DNA Extraction Kit (iNtRON). The concentrations of the gDNA were adjusted to 50 ~ 100 ng μl− 1. The 16S rRNA and dehp2 sequences from the above described strains were retrieved from NCBI. For the haloacids transporter gene dehp2, the sequences are available in 6 species (P. caribensis, P. fungorum, B. stabilis, B. glumae, B. cenocepacia, and B. multivorans), and the sequences are currently unknown in the other 5 species (P. caledonica, P. graminis, P. hospita, P. sacchari and C. glathei). The sequences of 16S rRNA or dehp2 were aligned using ClustalW . Three pairs of qPCR primers were then designed based on 16S rRNA: 16S-F1/R1 to target the region conserved in Burkholderia sensu lato, 16S-F2/R2 to target the region conserved in Burkholderia sensu stricto, and 16S-F3/R3 to target the region conserved in Paraburkholderia. We designed dehp2-F6/R6 and dehp2-F7/R7 to target Burkholderia sensu stricto-specific and Paraburkholderia-specific regions of dehp2. The sequences of the 5 pairs of primers are shown in Table 2.
qPCR was carried out using SYBR® Premix Ex Taq™ (Clontech) on the StepOnePlus system (Applied Biosystems) with a two-step method: initial denaturation of 95 °C for 30 s; 40 cycles of 95 °C for 5 s and 66 °C for 30 s. A melting curve program was also included to verify the specificity of the amplified products. Three replicates were set up for each condition, and negative controls were also included to monitor possible contaminations. To measure the amplification efficiency, 40 minus Ct values were used, which represent logarithmic transformed target abundance as previous described [54, 60]. To check the ability of combination of primer pairs to discriminate Burkholderia sensu stricto and Paraburkholderia, the difference between Ct values derived from 16S rRNA primers (Ct16S-F3/R3 - Ct16S-F2/R2), or between those derived from dehp2 primers (Ctdehp2-F7/R7 - Ctdehp2-F6/R6) were calculated. For qPCR reactions, besides the single strains analyzed, we also tested mixtures of different strains. To check the sensitivity of qPCR assays, serial diluted gDNA of B. cenocepacia LMG 16656 was used as template for 16S-F2/R2 and dehp2-F6/R6, while serial diluted gDNA of P. caribensis LMG 18531 was used as template for 16S-F3/R3 and dehp2-F7/R7. HC and PCA analysis of the qPCR data were performed using the SINGuLAR™ Analysis Toolset R package (Fluidigm). Xianbin Su, Yi Shi, Ruihong Li and Zhao-Ning Lu contributed equally to this work. We would like to thank Dr. Jimmy S.H. Tsang and Mr. Ka-Fai Kong from The University of Hong Kong for critical discussions and providing the genomic DNAs. This work is supported in part by the National Natural Science Foundation of China (81802806, 81472621 and 81402329), National Program on Key Research Project of China (2016YFC0902701, Precision Medicine), Medical and Engineering Crossover Fund of SJTU (YG2016QN71, YG2017MS67), the University of Sydney & Shanghai Jiao Tong University Joint Research Alliance (SJTU-USYD Translational Medicine Fund-Systems Biomedicine AF6260003), and funding from Key Laboratory of Systems Biomedicine (Ministry of Education) (KLSB2017QN-03). The funding bodies didn’t involve in the design of the study, collection, analysis, interpretation of data, or writing the manuscript. The authors declare that data supporting the findings are included in the article, and materials are available upon request. XS and ZH conceived and designed the study. XS, ZL and JW carried out experiments. XS, YS, RL, XZ analyzed data. XS interpreted the results and drafted the manuscript. All authors read and approved final version of the manuscript.